In the Homeric corpus, the "ægis" was the magical breastplate (or shield) of Zeus, which he lent to his daughter Athena in honor of her role in principled warfare. In most accounts, it was described as a goat-skin construction bearing a Gorgon's head at its center. Though it was important to Greek Mythology as a symbolic representation of the Sky God's patronage of his favorite daughter, its precise origins have remained uncertain - a fact that some scholars use to argue for the foreign provenance of Athena's cult and iconography. This position is lent credence by the fact that the majority of artistic depictions of the aegis (as well as many pre-Homeric myths) associate it more strongly with Athena than Zeus, implying that the Homeric usage could have served to naturalize this foreign imagery. Regardless of its origins, the term "ægis" has entered the English language as a symbolic means of describing the protection or patronage of a powerful, knowledgeable, or benevolent source. Likewise, scholars of religion and classicists have also used it to describe similar artifacts in other mythological traditions, where the Greek word aegis is often applied by extension. "violent windstorm," from the verb 'αïσσω (stem 'αïγ-) = "I rush or move violently." "goatskin coat," from treating the word as "something grammatically feminine pertaining to goat (Greek αιξ (stem αιγ-))." The original meaning may have been #1, and Ζευς 'Αιγιοχος = "Zeus who holds the aegis" may have originally meant "Sky/Heaven, who holds the storm." The transition to the meaning "shield" may have emerged as a folk-etymology among a people familiar with draping an animal skin over the left arm as a shield. It is also noted that since the Greek word aegis contains the double-meaning of "stormy" and "goatish" that this accounts for the close connection between the goat and storms in myth. The ægis (Greek Αιγίς), already attested in the Iliad, is the shield or buckler of Zeus, which according to Homer was fashioned for him by Hephaestus, furnished with golden tassels and bearing the Gorgoneion (Medusa's head) in the central boss. According to Edith Hamilton's Mythology: Timeless Tales of Gods and Heroes, the Aegis is Zeus' breastplate, and was "awful to behold." The Attic vase-painters retained an archaic tradition that the tassels had originally been serpents in their representations of the ægis. Powell summarizes the consensus on the artifact as follows: "The aegis, "goat skin," was an emblem of Zeus's power, a magical object that inspired abject terror in all who beheld it. Perhaps derived from a goatskin shield used in primitive times, it symbolized the storm cloud of the weather god. In art it is shown as a shield with snake-headed tassels; Athena, to whom Zeus lent it, often wears it as a breastplate." When the Olympian shakes the ægis, Mount Ida is wrapped in clouds, the thunder rolls and men are smitten with fear. Thereon the son of Saturn Cronus seized his bright tasseled aegis, and veiled Ida in cloud: he sent forth his lightnings and his thunders, and as he shook his aegis he gave victory to the Trojans and routed the Achaeans. In general, "Ægis-bearing Zeus" is one of the most common epithets for the Sky God in the Iliad, though, as Gantz suggests this moniker is probably better translated "aegis-riding" (which is compatible with the etymology mentioned above). Though it has been common practice to unilaterally assert the connection between Zeus and the aegis (likely hearkening back to the extensive use of aigiochos ("Aegis-bearing") as an epithet). the artifact is far more often seen in the possession of Athena (and, rarely, Apollo). In the latter case, Zeus sends Apollo to revive the wounded Hector and, holding the ægis, Apollo charges the Achaeans, pushing them back to their ships drawn up on the shore. This tradition was sufficiently well established that Euripides, in his play Ion, describes Athena constructing the aegis herself, after slaying a gorgon. Later Greeks always detected that there was something alien and uncanny about the aegis, which prompted considerable speculation concerning the frightening artifact's origins. In one origin myth, the ægis is represented as a fire-breathing chthonic monster like the Chimera, which was slain and flayed by Athena, who afterwards wore its skin as a cuirass (Diodorus Siculus, iii. 70). The wearing of skins in this fashion is also central to the archaeological understanding of the aegis forwarded by Murray. In a late rendering by Gaius Julius Hyginus, (Poetical Astronomy, ii. 13) Zeus is said to have used the skin of the goat Amalthea (aigis "goat-skin") which suckled him in Crete, as a shield when he went forth to do battle against the |titans. Still others say it was the skin of the monstrous giant Pallas whom Athena overcame and whose name she attached to her own (John Tzetzes, On Lycophron, 355). 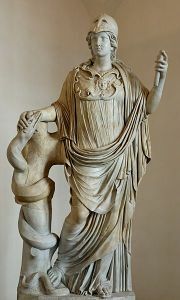 Athene's garments and ægis were borrowed by the Greeks from the Libyan women, who are dressed in exactly the same way, except that their leather garments are fringed with thongs, not serpents. Robert Graves in The Greek Myths asserts that the ægis in its Libyan sense had been a shamanic pouch containing various ritual objects, bearing the device of a monstrous serpent-haired visage with tusk-like teeth and a protruding tongue which was meant to frighten away the uninitiated. In this context, Graves identifies the aegis as clearly belonging first to Athena. There is every reason to suppose that the goat-skin had a ritualistic and not a meteorological significance. In certain cults in Greece, the goat possessed the mysterious and sacred character of a theanthropic animal, akin to the divinity and the worshiper; … The goat had a sacred and tabooed character in the worship of Athena on the Acropolis and once a year was solemnly offered her (Varro, De Agricult. 1.2, 19). It would be quite in accord with the ideas of a primitive period, when the divinity and the worshiper and the victim were all closely akin, that Athena should be clothed in the skin of her sacred animal and that in this, as in many other cases which Mr. Frazer has noted in his recent book, the sacrificial skin should possess a value as a magical charm. Being used in the ritual of the war-goddess, it was natural that it should come to be of special potency in battle; but the skin of the sacred animal of the tribe ought also to have a life-giving power as well, and it is interest to find that the aegis in an Athenian ceremony possessed this character also, being solemnly carried round the city at certain times to protect it from the plague or other evil, and being taken by the priestess to the houses of newly married women, probably to procure offspring. In summation, Farnell suggests that the odd and inexplicable characteristics of the aegis in the mythic corpus can be explained by reference to preexisting ritualistic practices. Homer preserves the nexus of the cultural emblem called the aegis, its material form, symbolic function, and associated ritual verbal behavior, anaphoric ένδέ, from the time of its presumptive diffusion from the Anatolian culture that engendered it in the second millennium. But in Homer there is no hint of this diffusion itself or of an exotic origin. Pindar on the other hand, a few centuries later but a member of the same class of "professionals of the word," not only associates the identical ritual verbal behavior, anaphoric ένδέ, with the cultural emblem of the aegis - in this he could perhaps just be following Homer - but also indexes both occurrences of the same ένδέ formula with overt or covert references to an exotic origin, specifically Anatolia. The aegis also appears in Egyptian mythology and worship. The goddess Bast and Isis were sometimes depicted holding a ceremonial sistrum in one hand and an aegis in the other—the aegis usually resembling a collar or gorget embellished with a lion's head. Further, such articles were relatively common in the temple cult of the later period, where they were inscribed with the portraits of popular gods (such as Isis). As an attribute carried by Bastet - in which case it has the head of the goddess - the aegis may be a symbol of the divinity herself; in its small bronze amulet form, with the head of a god or goddess, it would be a votive offering. As a large cult object, which in most of the extant examples is surmounted by a head of the goddess Isis (or Isis-Hathor), it may have been carried only by female members of the royal family in ceremonies connected with the worship of Isis, who represented the ideal of motherhood and was inextricably associated with the mythological foundation of the kingdom of Egypt, arising from the union of the Two Lands. In Norse Mythology, the dwarf Fafnir (best known in the form of a dragon slain by Sigurðr) bears on his forehead the Ægis-helm (ON ægishjálmr), or Ægir's helmet (However, some versions would say that Alberich was the one holding a helm, which are named as Tornkape, and has the power to make the user invisible, also the fat of fafnir makes the skin of siegfreud hard as an armor, except on one point). It may be an actual helmet or a magical sign with a rather poetic name. Ægir is an unrelated Old Norse word meaning "terror" and the name of a destructive giant associated with the sea. "Ægis" is the genitive (possessive) form of ægir and has no relation to the Greek word aigis. ↑ "Aegis" Merriam-Webster Online. Retrieved August 28, 2018. ↑ "Aegis" Online Etymology Dictionary. Retrieved August 28, 2018. ↑ "Gorgon Aex" Theoi Project. Retrieved August 28, 2018. ↑ Edith Hamilton, Mythology: Timeless Tales of Gods and Heroes (New York: Warner Books, 1999), 27. ↑ 5.0 5.1 5.2 5.3 5.4 5.5 Timothy Gantz, Early Greek Myth: A Guide to Literary and Artistic Sources (Baltimore, MD: Johns Hopkins University Press, 1993, ISBN 080184410X), 84-85. ↑ Barry B. Powell, Classical Myth (Upper Saddle River, NJ: Prentice Hall, 1998, ISBN 0137167148), 140. ↑ Homer, Iliad, XVII. Samuel Butler's translation. Retrieved August 28, 2018. ↑ "Zeus Titles" Theoi Project. Retrieved August 28, 2018. ↑ "Apollo went before, and kicked down the banks of the deep trench into its middle so as to make a great broad bridge, as broad as the throw of a spear when a man is trying his strength. The Trojan battalions poured over the bridge, and Apollo with his redoubtable aegis led the way. He kicked down the wall of the Achaeans as easily as a child who playing on the sea-shore has built a house of sand and then kicks it down again and destroys it- even so did you, O Apollo, shed toil and trouble upon the Argives, filling them with panic and confusion." Homer, Iliad, XV. Samuel Butler's translation. Retrieved August 28, 2018. ↑ Homer, Odyssey, XXII. Samuel Butler's translation. Retrieved August 28, 2018. ↑ A. S. Murray, "The Aegis of Athene," The Classical Review 3(6) (June 1889): 283. ↑ 12.0 12.1 Lewis Richard Farnell, The Cults of the Greek States (Oxford: Clarendon Press, 1907), Vol. I, 96-100. ↑ Robert Graves, The Greek Myths (London: Penguin Books, 1960). ↑ Calvert Watkins, "A Distant Anatolian Echo in Pindar: The Origin of the Aegis Again." Harvard Studies in Classical Philology 100 (2000): 1-14. ↑ Charlotte R. Clark, "An Egyptian Bronze Aegis." The Metropolitan Museum of Art Bulletin, New Series 12(3) (November 1953): 80. ↑ John Lindow, Handbook of Norse Mythology (Santa Barbara, CA: ABC-CLIO, 2001). Clark, Charlotte R. "An Egyptian Bronze Aegis." The Metropolitan Museum of Art Bulletin, New Series 12:3 (November 1953): 78-80. Farnell, Lewis Richard. The Cults of the Greek States, (5 vols.). Oxford: Clarendon Press, 1907. Murray, A. S. "The Aegis of Athene," The Classical Review 3(6) (June 1889): 283-284. Watkins, Calvert. "A Distant Anatolian Echo in Pindar: The Origin of the Aegis Again." Harvard Studies in Classical Philology 100 (2000): 1-14.